3D is a complex world of its own. In order to create 3D models, 3D programs are needed, like Catia, AutoCAD, etc. Each industry has their own set of preferred tools, solutions and document/file formats. (i.e. not the same as the PDF format acts as a digital exchange format/"digital paper"). but already well specified - not much expected to change before 2015 ). to see them or interact with these formats. 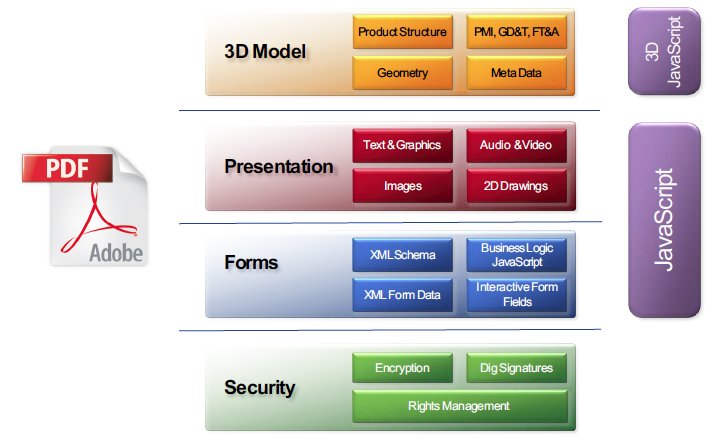 Recommendations on how to manage and archive 3D documents today. First and foremost you have to clear out the format in which 3D information is present. In what format are the 3D files; for instance, U3D or PRC format? PDF/A is an ISO Standard for long-term archiving with PDF. in PDF/A format or another format. for something that is embedded, but which is not itself PDF/A. with moving 3D models where required. - PDF/E-2 makes it possible to mend 3D models in U3D or PRC formats inside PDF. - PDF/E-2 is explicitly positioned as a standard for 3D archiving. In both cases it is recommended to focus on 3D in U3D or PRC formats inside PDF. It can be done already today and is also well supported by the Adobe Acrobat product family. Plans are to go from PDF/E-2 directly to PDF/A-4. Universal 3D (U3D) is a compressed file format standard for 3D computer graphics data. specifically at this time manufacturing as well as construction and industrial plant design. The format was later standardized by Ecma International in August 2005 as ECMA-363. for facilitating the adoption of the format. The library is also well known for having serious memory management issues. can be inserted into PDF documents and interactively visualized by Acrobat Reader (since version 7). Product Representation Compact (PRC) File Format (an upcoming ISO standard). PRC is a highly compressed format that facilitates the storage of different representations of a 3D model. or you can save the model's exact geometry (B-rep data). the PRC format using the 3D PDF Converter plugin for Acrobat. Computer-Aided Manufacturing (CAM) and Computer-Aided Engineering (CAE) applications.